Click on a chapter name to see one or two sample pages from that chapter. Chapter 1 - Using Character Conflicts: This chapter contains 200 scenarios that include characters with conflicting beliefs, motivations, wants, or needs. Situations are provided for two or three players. Chapter 2 - Using Contrasts: The 200 improvisation situations in this chapter provide contrasting character traits or emotions. Chapter 3 - Using Obstacles in Solo Improvisations: Each of the 100 improvisation starters in this chapter provides an obstacle that stands in the way of an objective. The player must find a way to overcome the barrier to the objective. Chapter 4 - Using lines of Dialogue: This chapter is divided into two sections. The first section includes 100 single lines of dialogue that will serve as the first line spoken in the improvisation. The second section includes 100 pairs of opening and closing lines. Chapter 5 - Changing Locations: This chapter contains 100 pairs of acting environments. The players must come up with a reason to leave one place and go to the other. Chapter 6 - Using Props: This chapter contains 100 lists of three common objects. The characters and actions performed by the players should simply evolve from the function and use of the props. Each item must play a key role in the scene. Chapter 8 - Historically Speaking: This chapter contains 50 situations that include interaction between historical figures that have common connections, but who lived during different periods of time. 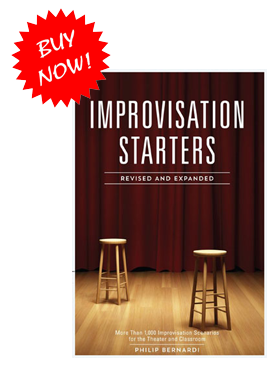 Chapter 9 - Using Improvisation in Non-Theater Classes: This chapter provides ideas and instructions for using improvisation as a teaching tool in classes of subject areas outside theater.